Are Bucks Avoiding Your Treestands? Some recent research on whitetail movements suggests that bucks learn where your treestands are located and even more importantly, they tend to avoid those areas. Most of us have been aware that sometimes we tip off a buck to our location. At times, the buck makes it clear to us that he’s “busted” us, but at other times, the buck may become aware of our presence by the slightest untimely movement, sound or wisp of human scent. In these cases he most likely sneaks away undetected, and we never knew we had a close encounter. Just how much damage do these negative encounters do to our chances of shooting a buck from that particular location? That question has been answered in a very definite way by some solid scientific evidence aided by today’s GPS technology. Clint McCoy, a graduate student at Auburn University, recently completed a study that tracked 37 bucks for an entire hunting season and compiled the data he collected into some very surprising conclusions. Ten of these bucks were 4 years or older, nine were 3 years old, ten were two years old and eight were yearlings. Each was equipped with a GPS collar that tracked their exact location to within a few feet and reported the results every 30 minutes for three years. Those millions of data points were all taken on a 10 square mile study area in South Carolina so the bucks had plenty of room to roam. On this study area were about 100 food plots totaling 300 acres, 60 automatic feeders and 100 treestands. Hunters were dropped off and picked up near their treestands. The hunting started on September 15 and ended November 22. It was recorded which stands had hunters in them and for how long. Each buck was tracked in relation to the hunters in the stands and specific attention was paid to what McCoy called a “Danger Zone” which was the distance a hunter could visually see from the treestand. 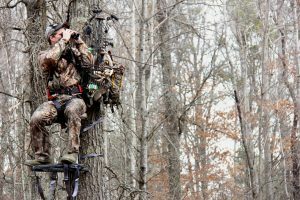 The results of this exhaustive study were quite revealing when it comes to the bucks’ awareness of the use of stands and their tendency to avoid those stands while hunters were present and for some time afterwards. It stands to reason that many of the stands were place in relation to the food plots. On August 24, one out of every three visits the bucks made to the food plots were during daylight. By November 22, the food plots were getting almost no daylight use. The data showed that the bucks were four times more likely to walk through the danger zone at the beginning of the season than they were at the end. At the end of the season, the buck’s average location was 55 yards farther away from any treestand than it was at the beginning of the season. The data also showed that the more times a stand was hunted, the more the deer avoided it. No surprise here. If, for example, you hunted a stand for 12 hours in any week, your chance of seeing any of the bucks was cut in half. This avoidance behavior lasted for an average of three days. Surprisingly, there was little difference in the avoidance moves between mature bucks and yearlings; they all learned to avoid the stands quite quickly. So what can we take away from this? Well the deer were tipped off to the presence of hunters in primarily three ways: Sounds, sight/movement, and scent. If we can reduce any of these three, we can increase our odds of seeing the bucks. Sounds are the easiest to control. Entering and exiting the stands is the worst time for alerting deer with noise. Dry leaves, cracking twigs and jingling equipment must be avoided. Some hunters go so far as to clear a path to their stand with a rake. Make sure your equipment both while travelling to the stand and while on stand is deadly silent. I was brought up with a strict regimen of going to the stand an hour before daylight in order to let our scent “dissipate,” I was told. I rarely do that these days. Consider waiting until daylight to walk to your stand. This is what I have been doing for several years and I believe I spook a lot less deer because I can walk much more quietly when I can see well, an artificial light source doesn’t tip off my presence, and there is a chance I might see a deer before he sees me and avoid a negative encounter. Having deer see you approach the stand is a dead giveaway. Use the screen of a ditch, ridge, or thick cover to mask your entry. If you are cutting trails to a stand on the edge of a food plot, put a bend in the trail right at the end so any deer in the field cannot see you coming from a distance. Make the entry and exit strategies just as important as all the other factors in choosing your stand locations. 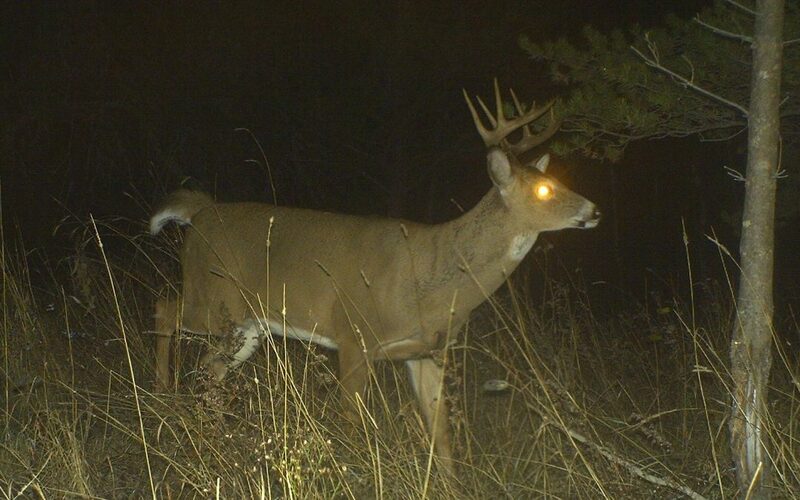 Wind currents can be the single most important factor in tipping deer off to your stand site. While we cannot entirely eliminate human odor, we can do things that will help reduce it. Spray down with Scent Killer on your pantlegs and boots so you minimize scent on the ground and on brush as you walk to your stand. Use antibacterial/antimicrobial soaps, shampoos and laundry detergents. These all help reduce your scent impact, but the most important factor is simply self control. If the wind isn’t right for a stand, just resist the temptation to hunt there no matter how badly you want to. One could say that there really isn’t anything new as a result of this study, but at the very least it adds some solid scientific data to things we already suspected. The bucks are patterning us, and we had better take every precaution we can if we are going to beat them at this game. Any tip for exiting the stand? Exiting..? At night I use a coyote howler.. It is a natural sound that deer are familiar with but also a noise that would prefer not see the critter that made it.. A couple of deer-hunting friends each lob an apple or two as noise-making distractions.